Nimrod Lehavi, co-founder and CEO of protected crypto-coins purchase service Simplex, bought his first bitcoin in 2012, when one token was worth $40. "I'm a bitcoin fanatic," he said in an interview with Calcalist. "I'll hold it until it reaches $200,000 or crashes to nothing." Founded in 2014 by Mr. Lehavi and two former employees of Paypal, chief technology officer Erez Shapira and chief analytics officer Netanel Kabala, Simplex offers online payment processing and fraud protection exclusively for the cryptocurrency industry—sort of like Paypal for bitcoin. The company currently employs some 70 people. 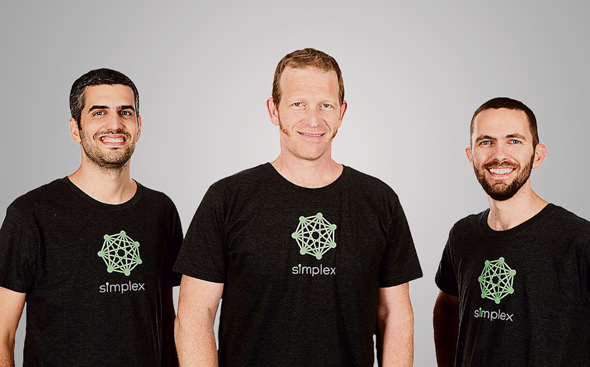 Simplex was established to provide an easier method of buying cryptocurrency with credit cards, a service Mr. Lehavi initially found himself in need of due to the remote location of his residence in a small village called Ein Vered in central Israel. Ein Vered has a population of around 1,500 people. "When I tried to purchase bitcoin I was rejected because the verification system did not recognize my address." Unlike Paypal, which offers members the ability to track and manage their transactions through their registered account, Simplex only covers the checkout process, but Mr. Lehavi says most people interested in buying bitcoin with credit cards use the service. "We work with various wallets, exchanges, brokers, and marketplaces, coming in at the end of the process, one step before the purchase is made," he explained. "Most people want to buy bitcoin with a credit card, because that's what they know, but it’s a difficult process." Simplex currently charges a 5% commission, but intends to lower it soon, he added. Services that provide fraud and processing protection for credit cards have existed for a long time, but the founders of Simplex decided to focus exclusively on a much riskier industry. While traditional credit card fraud involves stolen credit cards or identities, the anonymized nature of crypto markets make fraud even harder to trace, Mr. Lehavi explained. Crypto has ten times the fraud seen in the credit card market, Mr. Lehavi said, and it is much more complex to recognize it. It's also very easy for someone to then make purchases with bitcoin on the darknet. "Thieves have it easy with bitcoin." Simplex covers fraud-related cashbacks if they occur. The company is capable of covering around 0.1% of deals. "If we don't cover those frauds, our system won't learn anything," he explained. "That means we blocked too many transactions." Simplex raised around $9 million in total equity funding to date, and the company intends to raise more money. The company got its start on the savings of its founders, before raising $500,000 from two angels and $500,000 from the Israeli government innovation investment arm, Israel Innovation Authority. Venture capital funds wouldn't touch Simplex at the beginning, Mr. Lehavi said, unwilling to shoulder the risk. In 2015 the company raised $7 million from several Israeli angels.